I learned a trick from Vicki, my sister-in-law, that makes the thankful all year long. It involves yogurt containers and water. 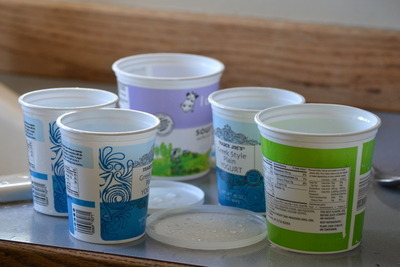 Filled cleaned plastic containers—like the ones yogurt and sour cream come in—with water, leaving some head space. Freeze. Presto shazam! You have ice for a small lunch-sized cooler. 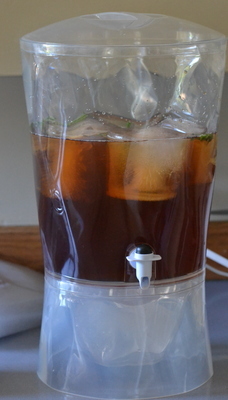 You have ice for ice-water, drink dispensers, lemonade, iced tea. I especially like the one pound containers; they fit every pitcher in our house. Here is a Iced Tea Syrup recipe that is great for thirsty souls. One hot summer afternoon we were at a friend’s house for lunch. We gulped down a gallon of iced tea. She picked up the empty pitcher and brought more cold tea to the table a minute later. Who stores iced tea by the gallon? “How did you do that?” I asked. “Oh, I have a syrup concentrate,” she replied. It’s my go-to tea now. Turn heat off, let bubbles die down. Add tea; cover and steep for 15 minutes. * I have used Splenda instead of sugar, with good results. This entry was posted in Uncategorized and tagged domestic, food, hints by alivingpencil. Bookmark the permalink. I make tea almost daily and this looks like a wonderful idea. Thanks for posting it. DH loves sweet tea. I may very well give this recipe a try!